Screen printing is a delicate art form that requires extensive practice and training. At ink+cotton, we pride ourselves on being expert live screen printers who will help your guests understand the printing process while simultaneously promoting your brand. It is a common occurrence for guests to be impressed with the techniques used to print a graphic on a t-shirt or tote bag. If guests are intrigued, the printers are more than happy to explain how a screen is printed and answer any questions guests may have. Many people are amazed upon learning that each color needs to be applied by a separate screen. Our printers have even been known to let the guest step in front of the press and guide them to help print their own shirt or tote bag. We don’t just provide a free t-shirt, we provide a complete and unique experience, something that is proven to make this event (and your brand) memorable. Your guests will remember being a part of the creative process it took to create their t-shirt or tote bag. It puts more emphasis and meaning to what a free t-shirt might mean rather than if it were simply handed to them by some generic brand. Your brand is unique, creative and loves to provide the ultimate experience for your guests. They deserve the ultimate treatment, and ink+cotton can help you achieve that. 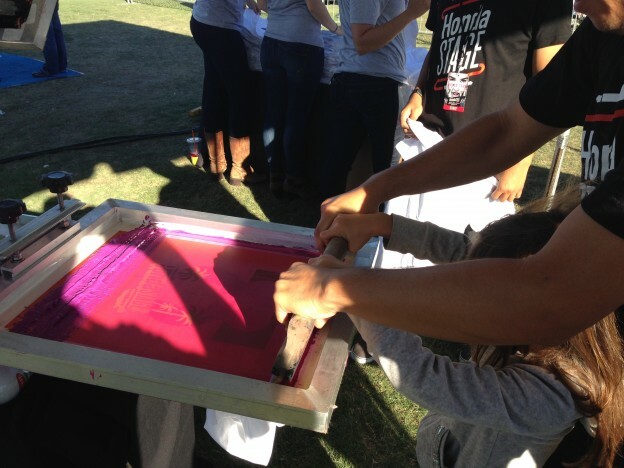 Live screen-printing is a unique option for product launch parties, conventions, trade shows, brand activations, grand openings, sporting events, internal company events, festivals of all kinds, and much more.